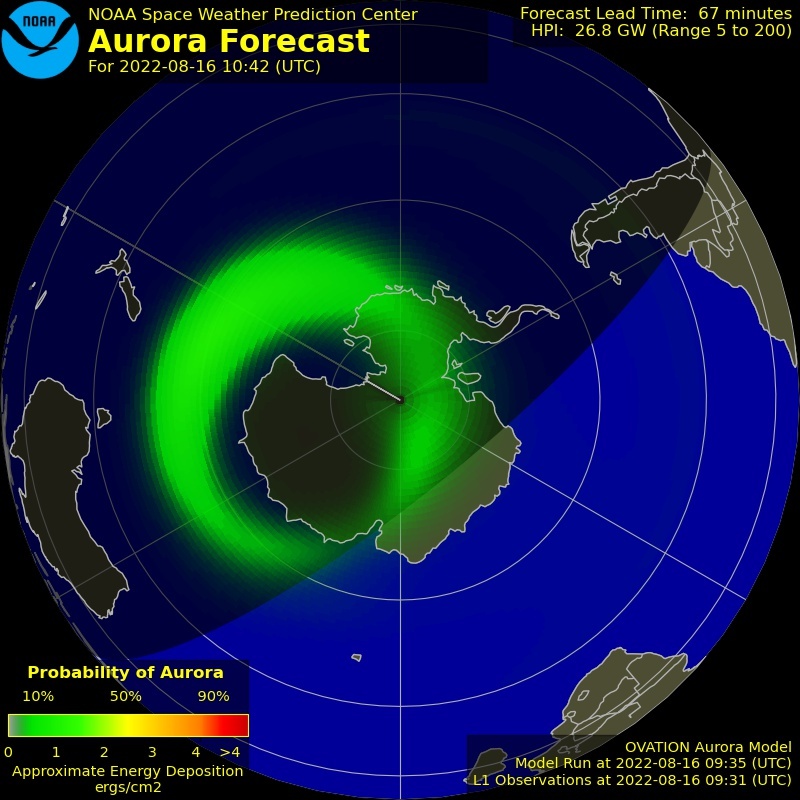 ARCTIC AURORAS POSSIBLE TONIGHT: An irregular hole in the sun's atmosphere is spewing a stream of solar wind toward Earth. Estimated time of arrival: Oct. 24th. 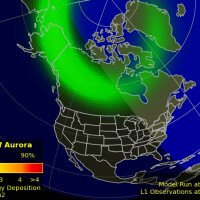 High-latitude sky watchers should be alert for auroras when the gaseous material arrives. A bright full Moon on Oct. 24th will add its luminosity to that of any geomagnetic storm, creating some nice landscape photo-ops around the Arctic Circle. 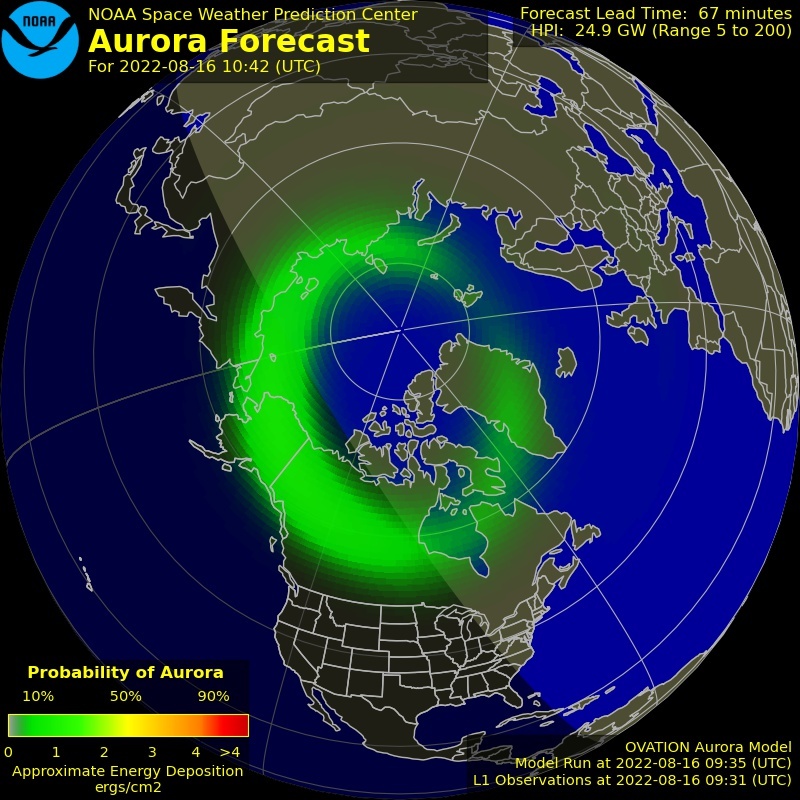 Free: Aurora Alerts. 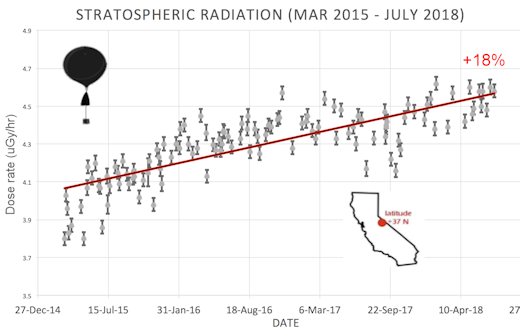 Since 2015, we have been monitoring X-rays, gamma-rays and neutrons in the stratosphere--mainly over central California, but also in a dozen other states (NV, OR, WA, ID, WY, KS, NE, MO, IL, ME, NH, VT). Everywhere we have been there is an upward trend in radiation--ranging from +20% in central California to +33% in Maine. The latest points, circled in red, were gathered during a ballooning campaign in August-October 2018. 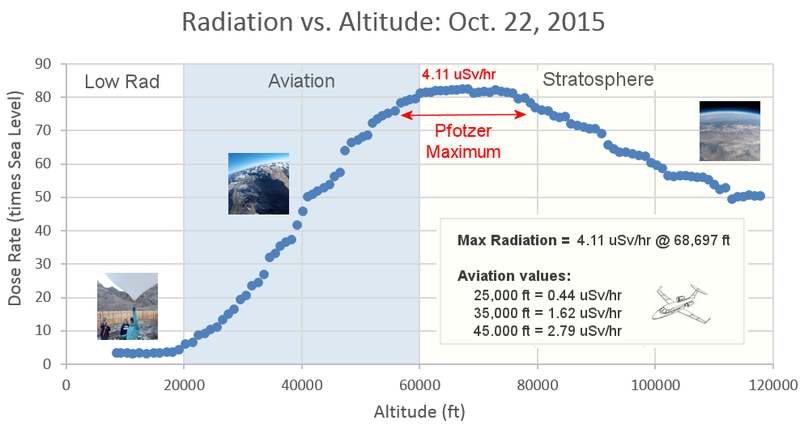 How does Solar Minimum boost radiation? 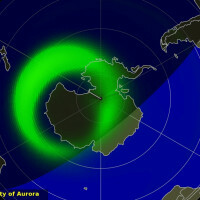 The answer lies in the yin-yang relationship between cosmic rays and solar activity. Cosmic rays are the subatomic debris of exploding stars and other violent events. They come at us from all directions, 24/7. Normally, the sun's magnetic field and solar wind hold cosmic rays at bay--but during Solar Minimum these defenses weaken. Deep-space radiation surges into the solar system. 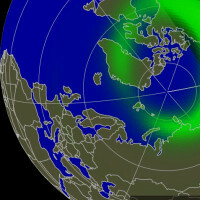 Cosmic rays crashing into our planet's atmosphere produce a spray of secondary particles and photons. That secondary spray is what we measure. 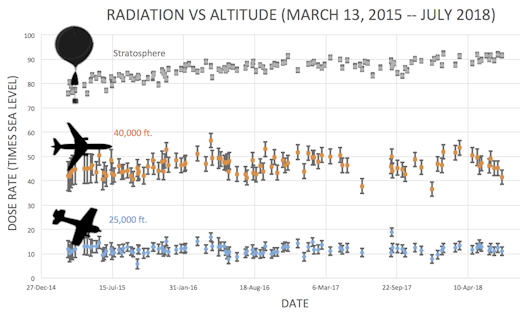 Each balloon flight, which typically reaches an altitude greater than 100,00o feet, gives us a complete profile of radiation from ground level to the stratosphere. Our sensors sample energies between 10 keV and 20 MeV, spanning the range of medical X-ray machines, airport security devices, and "killer electrons" in Earth's radiation belts. 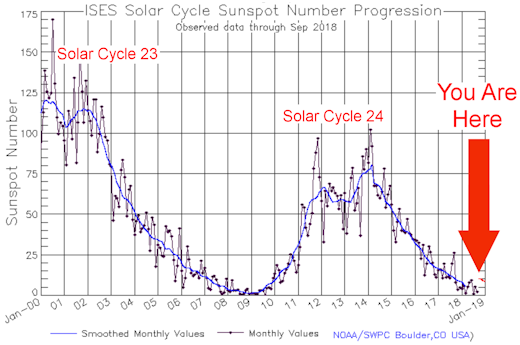 As 2018 comes to an end, Solar Minimum appears to be just getting started. 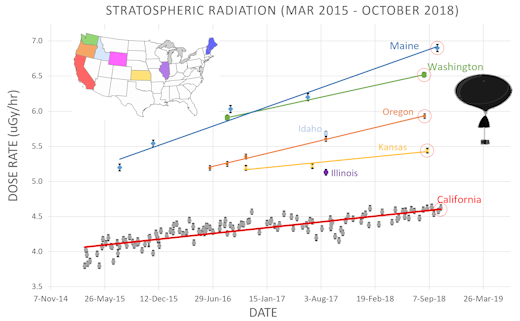 Cosmic rays could continue to increase for years to come, so stay tuned. A sharable version of this story is available here. You can have one for $79.95. 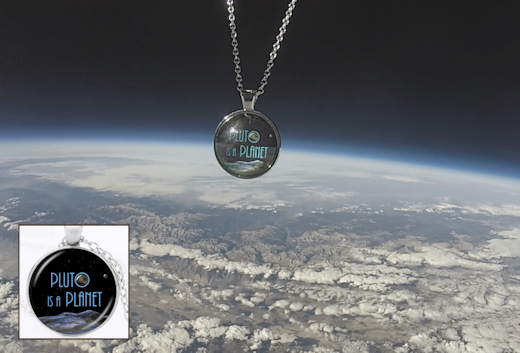 The students of Earth to Sky Calculus are selling these pendants to support their cosmic ray ballooning program. Each one comes with a greeting card showing the item in flight onboard a balloon, and telling the story of its journey to the edge of space and back. They make a great gift for rebellious astronomers! All sales support the Earth to Sky Calculus cosmic ray ballooning program and hands-on STEM research. 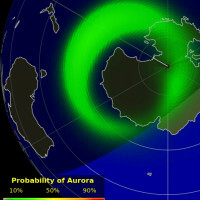 On Oct. 24, 2018, the network reported 25 fireballs. On October 24, 2018 there were 1936 potentially hazardous asteroids.